Everyone these days seems to want to be able to add wire work to their beading. Now here's a good place to start! Suzanne Tourtillott has edited a wonderful book for Lark Books, full of 40 projects by 27 different designers: Bewitching Bead & Wire Jewelry. There are necklaces, earrings, bracelets, and even rings to choose from! None of the pieces are difficult, and even the ones that are more time-consuming or precise have excellent directions to make them easier! 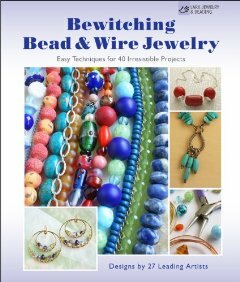 Would you like to win a free copy of Bewitching Bead & Wire Jewelry? Here's what you need to do...please read this carefully. Leave me a comment here and include your email address. If I don't see your email address, I won't be able to contact you. No contact, no win, and I simply have to go on to the next person. You are welcome to spell it out if you'd prefer, for example, cyndi at mazeltovjewelry dot com. If you tweet or post on Facebook or other social spots about the contest, you can leave a second comment and be entered twice! Deadline: May 29, 2013. Would love a chance to win this book. Sounds great. Looks like a great book...I would love to be able to look through it and get some ideas and tips! Thanx Cyndi for the chance to win this book. It sounds like it would be right up my alley. I just tweeted about your book giveaway. Sounds like an interesting book. Would love to win it. I would adore having this book as wirework is still a challenge for me. Ohhhhhh, I would so love to win this book! Pretty please count me in for this amazing giveaway! Thanks! I hope to win this book to add to collection of jewelry inspiration and designs. Thank you for your giveaways! This looks like a fun book. Thank you for the giveaway offer! OMG! What an awesome book to win! I'd love to win this book - what an inspiration it would be. I've posted about this giveaway on my FB. I love all that you have to offer! I would like to win your book because it is filled with projects I would like to try. Thanks for sharing your talents. Toss my name in the hat. thank you! This book sounds as if it was absolutely put together - just for me! I've been making jewelry since I was 12 years old (am now 83) but have never had good instructions. Obviously, I need to win- please? Something new to learn to add my own personal touch! Wow this is agreat site. I am new so any books would be great for me. thanks for the giveiway.